Eating is vital for everyone, and the ESL eating out vocabulary on this page will enable you to eat out in a restaurant or at a fast food stall. By learning the vocabulary on this page you will be able to understand when people talk about going to eat out. To start this page has a vocabulary list with many items related to eating out. Each of these words or phrases has a simple definition so you can learn what they mean. 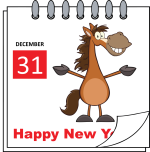 The list is followed by flashcards of the vocabulary that you can download and use to learn the vocabulary. Many of the flashcards also have a picture of the vocabulary item to help you learn them all. You should print the flashcards out so that you can take them with you to learn the vocabulary whenever you have some free time. Then after that there are two recordings of the ESL eating out vocabulary being spoken by a native English speaker so you can hear the correct pronunciation. Firstly there is a simple recording that you can listen to, and then there is a video of the flashcards with the words being spoken at the same time as the matching flashcard is shown. You can listen to these as often as you need to. Identify the correct definition for a given word. Identify the correct word that matches a given definition. Identify the correct word that matches a given picture of a vocabulary item. The list of ESL eating out vocabulary items that follows this has many words that you will need to know to be able to talk about eating out. Each word has a simple definition following it. 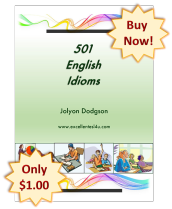 After this there are flashcards of the vocabulary for you to download. Then there are recordings of the vocabulary so you can hear the correct pronunciation as spoken by a native English speaker. 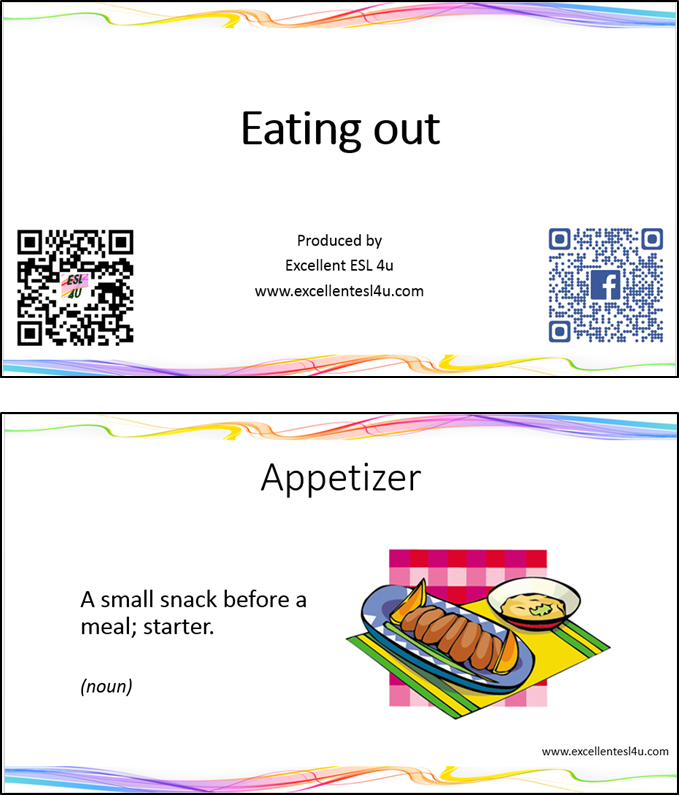 Either click on the following picture or link to download the ESL eating out vocabulary flashcards. Then you can print them to use when you are working offline. The following are two recordings of the ESL eating out vocabulary being spoken by a native English speaker. The first just has a recording of the vocabulary items that you can listen to, while the second is a video of the eating out flashcards with the spoken words matching the word on the flashcard that is being shown. For the first ESL eating out vocabulary exercise you need to choose the correct definition (A-D) in each of the 5 questions that matches the given word. Once you have finished you can click the get score button to see how many you got correct. Choose the correct definition for the eating out vocabulary in this quiz. 1) What is the definition of Buffet? A) A small restaurant selling light meals and drinks. B) Without a side dish. C) Self-serve tables of food that are set out for the customers to pick and choose from. D) A statement of charges for food or drink. 2) What is the definition of Cutlery? A) Tools for eating with (fork, knife, spoon). B) A person who helps out in a restaurant (especially clearing and setting tables). C) Food that is prepared in a particular way. D) A store where you can buy foods (such as meats, cheese, salads and sandwiches) that are already cooked or prepared. 3) What is the definition of Garnish? A) Unfinished food that is packed up for the customer to take home. C) Food that is added to a plate for appearance or color. D) A staff member in charge of greeting and seating customers in a restaurant. 4) What is the definition of Menu? A) The largest part of a meal, usually consists of a meat, vegetable and a starch. B) An occasion when food is eaten, or the food that is eaten on such an occasion. C) A set of cutlery wrapped in a napkin. D) A booklet or printed list of all the food that can be ordered. 5) What is the definition of Server? A) Food item that a restaurant is popular for. B) A person who brings your food and drinks at a restaurant; a waiter or waitress. C) A special meal that a restaurant offers on a particular day. D) A small portion of food served as the first course of the meal. The second ESL eating out vocabulary exercise has a definition being given in each question and you have to choose the correct word (A-D) that matches it. When finished you can see the correct answers by clicking the get score button. 1) What is the meaning of the following definition: A thin, flat piece of bread with filling in the middle? 2) What is the meaning of the following definition: A building in which alcoholic drinks are sold and consumed? 3) What is the meaning of the following definition: Food that is quick and inexpensive? 4) What is the meaning of the following definition: A meal as a set combination, such as a burger with fries and a drink? 5) What is the meaning of the following definition: A statement of charges for food or drink? 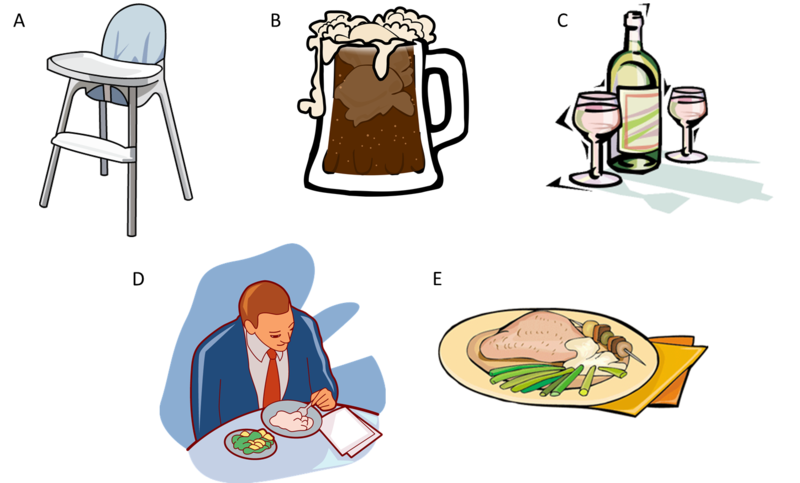 In the third ESL eating out vocabulary exercise you need to choose the correct word (A-D) in each of the 5 questions that match the pictures given below. Once you have done this you can use the get score button to see the correct answers and your score for the task.